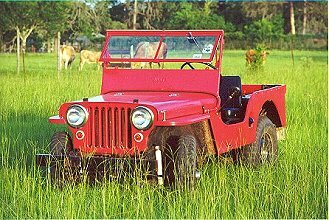 This beautiful red 1948 CJ2A was contributed by Larry J. Lloyd. "I bought this CJ2A from a friend at work. The body was in fairly good condition with some rust holes in the floor board. Found the engine had a cracked block and the head was cracked. I found a new "old" block and a good used head from the local jeep parts guy and had the engine completely rebuilt. The transmission needed new synchronizers and the steering parts all needed replacing. It mainly serves as a good father/son project and we work on it almost daily with some kind of tinkering."